Cardel has developed a unique range of film adhesives specifically designed for embedding chips in smartcards. These adhesives are globally used in the production of over 4 billion smart cards each year – including banking / EMV, ID cards and telco / SIM. The adhesives offer a high degree of flexibility, security and precision, and are suitable for PVC, ABS composite and Polycarbonate cards and have been developed for use with full range of module types (FR4, FCOS). The adhesives are compatible with all major production machines. 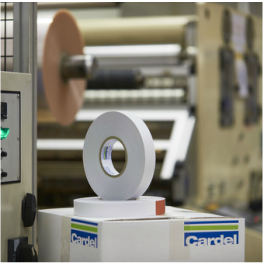 Cardel’s Hi Bond is rigorously tested against ISO and CQM standards. It offers a long shelf-life (2 years+) with no need for special storage conditions (e.g. refrigeration). Cardel has developed adhesives for a range of specialist applications, including high volume production of laminated insoles for the podiatry market. Cardel manufactures and supplies a range of mailing labels for secure attachment of ISO plastic cards to letters and forms. Our range of labels covers most major automated mailing machines. Offering secure attachment to both the card and the letter/form, with no damage to card and easy-peel from card surface.